When Square Enix revealed its plans to release Dragon Quest titles on NX last year, it became the first third-party to pledge support to Nintendo's mysterious new console. Such news would suggest that the firm has NX dev kits in hand, and this lends credence to the following rumour. Got a handful of salt ready? Let's begin. According to SuperMetalDave64 - a YouTuber with a reasonably solid track record when it comes to rumours - Final Fantasy VII Remake and Final Fantasy XV will both be ported to Nintendo NX at some point. Furthermore, both versions could end up being the definitive editions, as the source claims that NX will surpass the PS4 in terms of processing power. It's worth pointing out for a second time that this is the kind of rumour that multiple pinches of salt should accompany; SuperMetalDave64 even explains that his unnamed source in this case isn't a developer on either project, but has given him solid information in the past. On paper at least, the rumour isn't that hard to believe. 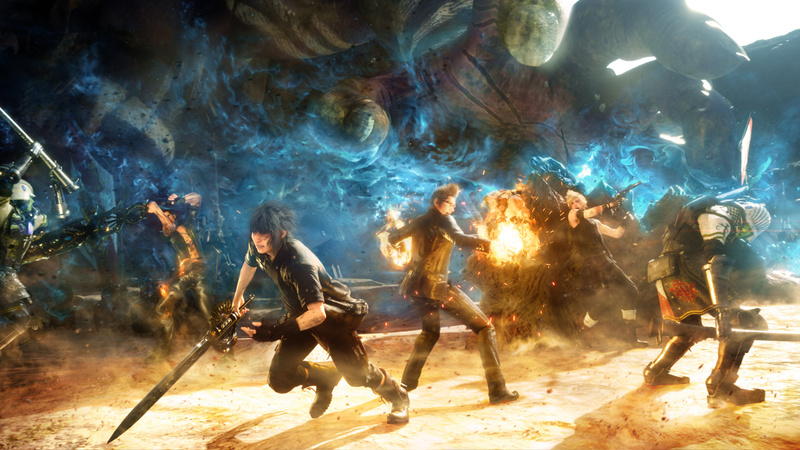 In the case of Final Fantasy XV, it's already a multi-platform title confirmed for PS4 and Xbox One, so a release on NX would certainly make sense. Final Fantasy VII Remake, on the other hand, is currently exclusive to PS4 and given Sony's close association with the legendary seventh outing, it might be reluctant to allow Square Enix to release the game on a rival system - at least not until the PS4 version has had its time in the limelight. As for Nintendo's relationship with Square Enix, it's arguably on the up and up. The company has recently allowed one of its most treasured characters - Final Fantasy VII hero Cloud Strife - to join the Smash Bros. roster, and Final Fantasy Explorers has just launched as a 3DS exclusive. So the two firms are clearly talking to each other a lot these days. What do you make of this rumour? Do you think it has any substance, or is the source merely guessing based on the notion that Square Enix already has NX dev kits in its possession? Let us know by posting a comment below. @Faruko Yep, I remember reading ''Play it first on PS4'' or something along those lines at the end of the remake's trailer. Certainly not an exclusive. Also, this'd be cool - both NX being that powerful and these games being released for it. I'm not a Final Fantasy fan by any means, but they could really help the console have an attractive line-up at the beginning. Also, I'm trying out the original FFVII as of late, and if I do enjoy it I'll be interested in the remake after all. Great news if true. Hoping the NX comes out this Fall (Sept-Nov) myself. A definitive version of a third party game on a new Nintendo system? I'll only believe it when I see it. Too many false promises have been made to us in the Wii U's short lifespan alone. All that I understand by "more powerful" is "pricier". I know, I know, rumours are to be taken with a grain of salt, but this requires numerous salt mines. Yet again, I'll wait for something more official. We don't even know how the "NX" is going to turn out for God's sake. @LinkSword Yeah it did mention "Play it first on Playstation 4" at the end of the December PSX trailer. So I would imagine at least six months to a year of PS4 (maybe PC included) exclusivity. @WireWare Not exactly, the PS4 and the XB1 were already cheaper than what Sony/MS were selling, that was 2.5 years ago or something. VII's remake is probably just a timed exclusive. They said play it FIRST on Playstation. Wouldn't be at all surprised if they came to NX though. Throw in the new Dissidia while you're at it! I've seen nothing about it being on PC. Not that it won't, mind. I just havn't seen any confirmation. Rumors are rumors, so we're gonna need some salt, ESPECIALLY with this one. Though this would be pretty big if it were true. It would also make Cloud's inclusion in Smash a bit less...awkward. @Faruko And Xbox One down the line too. Honestly I just wan't the NX details already so we can get the full scoop. The barrage of rumors is killing me. Is that's true though then there WILL be a storm. I'm not really a Final Fantasy fan (I bought the PS1 trilogy and X/X2HD last year, but haven't played them yet; at this point I've only played III on the DS), but XV looked interesting, at least. I wouldn't be surprised if this rumor was true, especially if the NX is a handheld/console hybrid. Japan loves handhelds, and Square is making Japanese RPG's. The fact (we can call it that, right?) that Square is already developing DQ for the NX helps, too. This would be nice, at this point I just want Nintendo do to tip their hat and show us something. Oh man, this would be amazing. As a massive Final Fantasy and Nintendo fan, I'd be ecstatic just to see either game on the NX. Though it is just a rumour at this point and the, "Definitive version" thing seems really wishful. I personally hope this happens. I also wouldn't mind some Snes FF goodness remade or coming to VC... Time will tell! It did seem a bit odd that Cloud was added into Smash, considering how he has little to do with Nintendo consoles. I think VII will definitely be showing up at some point, but I don't know about XV. I don't think it'll happen (or if it does it'll be really dumbed down ports) because Nintendo doesn't make powerful consoles anymore. NX will be reliant on some kind of gimmick. Even if this rumor is true, I still wouldn't buy either of them. Aside from the Bravely series, I would much rather Square make Final Fantasy games that are true to its name. I would love it to be true HOWEVER, I really doubt it to be the case especially with Final Fantasy 7 being so closely tied with PlayStation I wouldn't be surprised if Sony has some kind of exclusive deal in place to prevent any definitive edition appearing anywhere other than PS4. Also, if the NX was to be a hybrid console then I doubt it would be more powerful than a PS4 unless Nintendo were happy to make a big loss per unit sold. I think I might cry if I could actually play a main entry Final Fantasy game on a Nintendo console again. They've made me wait about 20 years! Now please bring KH3 to NX. I've really been hoping for that FFVII remake more than anything. Looks awesome. Final Fantasy VII? On a Nintendo machine? FF7 is one of my all-time favorite games, so for me this sounds too good to be true. Wake me up when there's an official announcement. I somehow doubt all that, and I really doubt th NX will be more powerful than PS4, if anything it'll be weaker, but i'm not counting it out entirely. No hype for me. Seeing FFVII on a Nintendo console would be so weird. MAKE IT HAPPEN NINTENDO. "Could Nintendo's new console be more powerful than PS4?" Final Fantasy VII is NOT a PS4 exclusive. It is 'play it on PS4 first', so basically a timed exclusive, like Rise of the Tomb Raider. It will be exclusive at first on PS4, but the fact that they said that it is only first on PS4 means that it will come to at least one other system at a later date. Here's hoping that this turns out to be true. I would love if the NX turned out to be more powerful than the PS4 and I would pick both of these games up regardless of the NX's power. Not that hard to believe actually. Completely reasonable rumor. Also, FFVII Remake is only timed exclusive. PS4 can't be the definitive version if it's releasing on PC or NX by default, and I somewhat doubt it will come to XB1 unless Microsoft paid Square Enix. @Grumblevolcano PS4 and XB1 were very outdated hardware upon their release. Not hard for the NX Console to be more powerful than the PS4. In fact, it would only be natural. Nintendo has never released a console that was weaker than any of the previous gen consoles (Wii is more powerful than PS2/GCN/Xbox and Wii U is more powerful than 360/Wii/PS3). That being said, there's always a first for everything. @Captain_Gonru It was the "Director's Cut", and while the 2nd-screen-features were attempted in the 360 and PS3 versions (Smartglass and Vita) it wasn't so well implemented as with the WiiU. I thought this the day cloud was announced for Smash. It just make logical sense. Now will it happen, please God I hope so! Of course the NX will be more powerful than the PS4, but only slightly. Then Sony will release their next gen console and it will be even more powerful. It's pointless trying to out-power current gen consoles when they will always be superseded by something even better. Anyway, hopefully this is true. With Nintendo and Square getting cosy these past years, with Smash, Bravely and then the Dragon Quest remakes coming up, it's no big surprise. Still no 3Dmake of FF6 though, which I've always wanted. Oh and if we're getting the FF7 remake I'd love the original port too. That sure would be one good start to potential third party games. We need to open a salt mine for this one. To be honest though, if Nintendo's 9th gen console isn't at least as powerful as Sony's 8th gen console, there will be a problem. It's not surprising to me that the NX will be as if not more powerful than the PS4. 3 years after the PS4's launch? It would be stupid not to make it more powerful. Like Nintendo waiting 5 years and have the N64 struggle with games like RE2, having a weak NX would be foolish. But people getting hyped by this is hilarious. I remember the exact opposite happening with games like Arkham City and ME3 and they were far from definitive. A million and one things will have to change for Nintendo to have anything 'definitive' or even worth buying if their past 3 systems have been any indication (3DS tanked at launch, Wii U has failed every sales forecast and the Wii spent the last 2 years before the Wii U the opposite as it started: everywhere, with no one wanting one and no new games to be found). @sillygostly I agree with your comment 100%. Nintendo consumers were burned on the launch of the 3ds and the WiiU has been a disappointment in terms of 3rd party support. Even if the NX releases "guns blazin'", I am going to be observing its progress into the console's life cycle before I decide on a purchase. If the NX happens to be more powerful than the PS4 and is supported by 3rd party and has definitive versions of multiplatform games (Which is only logical if it's Powerful than the PS4) and yearly sports updates Ofcourse then the first thing I'm going to do is sell my PS4 and buy the NX. Though I'm really loving exploring the PlayStation exclusives and the remasters of things that i missed previous gen as I had an Xbox last gen. I've been really into Uncharted recently and waiting on Uncharted 4... Well on a second note maybe I'll keep PS4 or atleast see all the upcoming exclusive games on it before i make my decision, might just be worth it. Well still a year to go do no hurry. I'm mostly a Nintendo fan; even if third party's abandoned the next console (I hope they don't btw) I'll still have the core N franchises I've loved for years. But I hate that I can't have all my favourite games together on one device. I'd love for this rumour to be true and be a solid, worthwhile port. The success of something like this could certainly inspire other companies on the fringe to follow suit and give the NX a decent chance to allow Nintendo to catch up in terms of appealing to the largest audience possible. I will hold out for one year after ff7 & ff15 are released on the ps4, if SE announce them for NX ports I will buy them for the NX. If not, then I will get them second hand for the ps4. But that will be in 2018/9 and the ps5 will prob be put by then lol. @sillygostly Well there are definitive versions of games on the Wii U already. Games like Batman Arkham City, Need For Speed: Most Wanted, Darksiders 2, Deus Ex: HR, Ninja Gaiden 3, Tekken Tag Tournament 2 were all Definitive version in one way or other which most Nintendo fans ignored.TBH. Powerful or not, I doubt a numbered FF game will come to a Nintendo console any time soon. I think they're looking at numbers here, and the fact that most people have moved on from the big N.
@WireWare More powerful is always going to result being pricier. It's coming to PS4 first. So don't get your hopes up Nintendo-only owners. Plus it's episodic and will be a totally different game from the original. Open World Map is most likely out of the question, as is the traditional battle system. Hell, I bet you'll be able to buy DLC to keep Aeris alive. @Grumblevolcano well WiiU was more powerful than PS3/Xbox360 so it's not like they don't do powerful consoles. Running ports of games made for few year old consoles shouldn't be problem if NX is real homeconsole. It HAS to be equally/more powerful than current gen consoles, otherwise, if it's underpowered, it will be Wii U all over again. Doomed to fail. Please get this right. Color me interested. If given the choice between getting the games on PS4 and NX, I'd pick the NX. However, I'd assume that at least FFXV will be out before the NX is released and as such, I'll end up getting it on PS4 since I usually get my games as early as possible. Just like to fire out that the FFVIIR E3 trailer said "first on PS4". Taking that into account, and it seems perfectly reasonable that Xbox/PC/NX would get ports afterwards. Smash 4's jarringly random inclusion of him would be indeed very telling, though hardly could Final Fantasy Explorers be seen as hinting at this. It's been typical of Square Enix, so far, to supply Nintendo's handhelds with only experimental entries since at least the DS. To see DLC of their biggest character in one of Nintendo's biggest console games is unprecented. This was too obvious. I get one thing that likely drives this rumor: Cloud in Smash. But let's look at FF's history. The first 6 games were exclusive to Nintendo systems. The 7th was a Sony exclusive. And since then, the only main series games to appear on a Nintendo console are VC or remakes. But because of that history (and the fact Final Fantasy is one of the most iconic series' in gaming) it was only natural for Square, like Capcom, Sega and Namco, to want their characters in a game like Smash. And out of every FF character, arguably none is more typical than Cloud. He is a fighter. He battles giant monsters. And he has a very distinct look. Think about it: no other FF character has ever had a movie based on his game. 7 inspired Crisis Core. Cloud v Sephiroth IS Final Fantasy. It is the definitive confrontation in a game that changed the series. Would be so stoked if these came to NX. It's believable too since Square told us last year they already had a couple of games in development for NX. They would be the first numbered FF's on a Nintendo console since VI on the SNES too. This would be so big!!! wow, this would be the most cruel april fools joke ever for me. I'm a huge fan of Nintendo but Final Fantasy is the only franchise that keeps me returning to PS. glad we're not in april so there would still be hope. this would be awesome. Here's hoping, but the 'definitive' versions will be on PC. XV and VII remake are likely headed to PC as well. if the first nx unit is portable, that would mean the remake can be played on the go. stating the obvious, yes. Please let this rumor be true. The last FF I played was 13 and I did not like it. 7 was so good. It made me get a PS1. I got a PS2 just for the other sequels. This is Square we are talking about. Even if the rumor is true other regions won't see this until 5 years later. I hope not. Please be true. I love the epic music at the end of 7. It's Sephiroth! This is the kind of rumor that will make me drool. This is the greatest rumor I have ever heard. I'd love a FFVII remake on a Nintendo console, though. Honestly, this is what I was expecting in the first moments of the Cloud x Smash Bros. trailer. I'm taking this as nothing more than a rumor, but please... PLEASE BE TRUE. I remember when they said Watch_Dogs on Wii U was the definitive version. I think people forget just how "buddy buddy" Square really is with Nintendo because it doesn't show in the West. Their biggest franchise in Japan, Dragon Quest, has all but become Nintendo exclusive over there. With Final Fantasy VII on Nintendo, a definitive Smash 4 for NX, the NX being stronger than current systems, and Mother 3 rumours, Im getting really excited for this year. If true it would appear I just bought a PS4 for nothing..
@Xaessya Who said that? Ubisoft? Does anything they say make sense? Not getting my hopes up on this one, or 2 really, but I suppose anything is possible. More likely FF7 than FFXV, which has been in the works for 10 years, don't see how it just pops up now on NX. FF7 is going to be released in parts - 3 or 4 - Squenix isn't saying - so I can imagine NX getting the "complete" edition in about 5 years when it's finished. I'm sure there are other corners they could cut as well, but it's like midnight and I'm too exhausted to think of any more. This would be one more reason to get NX. I hope this is true. "Final Fantasy VII Remake, on the other hand, is currently exclusive to PS4 " this is not true. It's not an exclusive, it just is being released on the ps4 first. It even says on the trailer "Play it first on PlayStation" not "PlayStation exclusive" so if you need a source watch the trailer ending. This is a truly delightful rumor and I would be really happy if this is true. And if it is I'm pretty sure that'll push some VC of Final Fantasy to make its way on the eshop while we wait for the game. Square Enix would be insane not to bring FF15 over to NX, it's already coming to PS4, XB1, and eventually PC. The FF7 remake is iffier, but it will probably be the same way. Mhmm, hopefully this is true and that Kingdom Hearts 3 will get ported too. Would be great. If true then it would be the first in a long time that a main Final Fantasy title return to Nintendo's system since Final Fantasy VI. Nice. Now can we get kingdom hearts 3 please? As great as 1080p 60 FPS gaming on the NX would be, most rumors on the NX at this point have pointed to the NX only being about as powerful as the PS4. I also have high doubts about the NX version of FFVII Remake being the "definitive" version, even if the creation kits for the NX have been handed out, Square Enix has no idea if the NX will even be successful to start putting in effort into developing for it. FFVII Remake is being sold in pieces as it's developed anyway, and I wouldn't buy the game until it's complete and I know if it's actually good or not. Square Enix seems quite fond of this sales platform as of late, they're running it for the new Hitman game too. It's not like Square Enix is a small company that can't afford to fully develop the game, they are doing this because it's beneficial to them. As TotalBiscuit put it, it's pushing the risk of game development from the publisher to the consumer, and that should never happen. I hope these rumors to be true. @ElementSponge Yes, that is exactly what I'm hoping too! I don't want to get too excited, but I'd like to think that the plans for DQXI on NX and Cloud in Smash Bros at least suggest that Ninty and SE are becoming close buddies. It would be very cool! @Kuhang : I didn't say that there weren't any definitive versions whatsoever, but many of them have been deprived of features from other versions, or have been released really late. Need For Speed: Most Wanted U is hardly the "definitive edition" considering that it crashes frequently and doesn't have the DLC of the other platforms (plus it was released 6 months late). Criterion may claim that it is the "definitive" edition, but the evidence suggests otherwise. I wanted to support third parties. I really did. But they didn't support us with a release that was at least on par with the other platforms. Why should we pay more for a lesser product? They aren't "definitive" in my opinion if they arrive many months after the PS4 releases. Don't get me wrong, this is awesome news. But Nintendo should go the extra mile and get them BEFORE PS4. Or even better: NX exclusive. Now that would be something!! As interesting as these rumours are, I really want to know what the NX actually is before I start getting hopeful! I also understand, and some of that salt could be involved, that Mystical Ninja starring Goemon on the Nintendo 64, is being remade for the NX. Unless someone really screws up the PC port, those will be the definitive versions. Even so, having a "definitive console version" would be a nice change of pace for Nintendo, or more to the point, having any version of a current-gen AAA multiplatform game, would be sweet. This dpse line up with a few things we've heard before (DQX, DQXI coming to NX) and makes cloud's smash appearance more logical, double so if Smash definitive is hitting NX at launch. Also Square was super cagey about where FF7 was going after PS4. Thing is that looking at the footage of FF7 Remake, they have completely changed the battle system so it looks like they may have killed my most favourite game, for good looking graphics. Also they say that it is going to be a 3 part game, so yes you have to buy part 1 2 and 3. Like when Square got taken over by Enix, they have just turned in to a money making machine making remakes or sequels and changing a game play completely ie FFX-2 and besmirched the first games greatness. Considering that Cloud is in Smash that could be taken as a sign of a strengthing of Nintendo's relationship withe Square Enix. If this happens then I will be one happy camper! I just hope they leave the battle system as it is in the original. The 'action' battles of recent titles are supposed to make it more interesting but I find them frustrating and more stressful than exciting. If they change it slightly sure but turn-based fights were fine back then, they're fine now! If this gets confirmed before FF XV actually releases, I may even not get it for PS4 and wait for the NX instead. Call me a traditionalist, but Square RPGs will always be at home on Nintendo consoles for me. Well it would definitely be nice to have both of these release on the NX console, even if we know nothing about it. @abbyhitter I have been waiting so long for a main series Kingdom Hearts on NX! Maybe they could even port Kingdom Hearts 1.5, 2.5 and 2.8! Don't see why this wouldn't be true. Nintendo and Square-Enix have become very friendly again recently. If the NX is in the same ballpark as the PS4 and X1, of course they'd release FF on their. I mean, it's no secret that Square-Enix where one of the first developers to get NX dev kits (OK, it was a secret, but remember they announced DQXI for NX, so we know they have them). So they've had more than enough time to port FFXV over, and FFVII: Remake is still in development so that'll be simple enough to do. Also, FFVII Remake only said first on PS4. FFVII is getting an episodic release on the PS4, once the full game is out, they can then release it on NX. It's only a rumor but it's not like anyone is saying anything super crazy. There is a real solid chance that the NX will be more more powerful than the PS4. If it is, would it be wrong to speculate that it will receive ports of existing games from the PS4 & Xbone? On top of all that, we have Cloud in Smash! Would anyone have guessed that a year ago? Well sounds interesting if it's true but in all honesty, I'm kinda wary of it all not so much on Nintendo's end but given how the remake is to be episodic my nostalgia cash grab senses are tingling. I'm not saying that FF VII can't be done right episodic for an appropriate price(i.e. not 40 bucks for 10 hours not including exclusive glow in the dark DLC underoos for an additional $10 and your favorite pinky). Just hoping Sqeenix doesn't butcher the product for the sake of a quick buck. I thought this was pretty much guaranteed already without the need for some Youtuber 'confirming' it. It's no coincidence in my eyes that FFVII Remake's reveal left the door open to it being on other systems, then SE confirm their intentions to support NX with the less popular Dragon Quest XI and then Cloud gets in Smash. Too many things there that point to a single outcome, which is mainline Final Fantasy on a Nintendo platform. It would be about time for the prodigal son to come back home. @sillygostly It's a 3rd party multiplatform title and in most cases they are not perfect.The game had better graphics than all other console counterparts, it had exclusive features to Wii U and Nintendo exclusive theme and paints with Nintendo Easter Eggs etc. What else would you have them do to make it the definitive version? Granted the game lacked the DLC but maybe part of it was the bad sales but mainly because EA wasn't supportive at all to extreme point about Wii U port of the game and everything good were the effort from the developers. EA refused to market the game at all and when the developers seeked for help from Nintendo they weren't interested either so the game suffered. For this very reason criterion co founder Alex Ward left EA. So the effort was made. Man I hope this is all true. I've got my whole salt shaker ready though. And remake the 6 while at it. Not one, but TWO main series FF games coming to a Nintendo console? Square must've seen all that Sm4sh Cloud money and been like, "Oh heck yes!" Only an idiot would think that the NX won't be more powerful than the PS4 and the Xbox One. The Wii was more powerful than the Xbox; the Wii U is more powerful than the PS3 or 360. Obviously the NX will be more powerful than the PS4 and Xbox One. It's a 9th gen console; of course it will be more powerful than 8th gen consoles. As for the rumor, I think it's very likely that Final Fantasy VII will be on the NX. That's been my theory since Cloud was first announced for Super Smash Bros. They were quite clear to say FF7 would come to PS4 FIRST. I think that clearly suggests non-exclusivity. Somehow, the most unlikely part in this article is the bit about NX being more powerful than PS4. I'll believe that when I see it. @TheHeroOfTime333 @QuirkyNuzleaf I do think there's no point in KH3 being on a system that doesn't have the other games so having the other games ported over would be logical (I'm not just talking NX here but have the same opinion regarding XB1). Dude. You picked the PERFECT music piece for this! Tell that to the GBA, NDS, 3DS, and PSP. Seriously, the KH has jumped from console to console so much, it would be weird if today's Square actually started caring about porting over the other games in this wildly meandering series. @SmaMan Those consoles are all handhelds though (i.e. weak), not even the New 3DS would be able to handle the first KH game. You guys need some kind of rule about rumours. Maybe you can't have more than 3 unresolved rumours at a given time! We've still heard nothing about the last few! Apparently NX will be powered by an i7 and Titan X. Hence the X. Any, either or both here is my money!! Ps3 was out for 7 years before the Ps4 came out. If the NX comes out at the end of 2016, that gives it 4 years of dominance/best quality ports (other than PC) so long as it doesn't have some strange architecture driving away third parties. Also, there's the worry that Nintendo games are so good, that the third parties don't want to compete on the system. I actually think this was a big problem with the WiiU, especially in its early formative year or so. I would not be surprised by this rumor at all. Maybe it'll come out later and be a collection of the episodes. Well the NX really should before powerful than the PS4 but how does the weaker handheld part play the games? In any case Nintendo's biggest problems are the damage caused by the Wii U and the PS4. The latter of which will have over 50 million in the wild by the time it fully launches and in terms of games will be coming into its prime. Square Enix would be shooting themselves in the foot by releasing a definitive version the NX when FFVII was a Playstation exclusive. oh wow. huh. that would be cool. but this console gen has taught me to take everything Nintendo says (or rumors of Nintendo) with a huge grain of salt. Seeing as Dragon Quest X & XI was never confirmed for the NX, but was only "under consideration" for it. I just cannot see FFVII Remake being on it, & wasn't the NX supposed to be a hybrid? to meny rumours to choose from, underpowered as powerful & more powerful. @Nico07 The problem with that argument is serious though. it's going to be episodic. It's hard for me to imagine part 2 being released on the PS4 and then the exclusivity is up. It's more likely to be something like a 1 year or 2 console exclusivity than a petty 6 month one. The grain of salt would have to be massive. I doubt it would be the "Definitive" version. If the NX doesn't have a Blu-Ray and the NX doesn't have a physical laptop hard drive or better, this is not going to happen. According to SE these games are going to be 40+GB in size. The PS3 was more powerful than the Xbox 360, but the Xbox 360 was easier to develop for by a landslide. So unless Nintendo makes their console the easiest to program for, or has a HUGE power increase over the PS4 (which is unlikely) and for about the same price as the PS4 or less ($350 with a game which is what some Wii U bundles are at despite the Wii U being only $180 in parts) this all seems like just insane ramblings. There's just no real evidence Nintendo wants to give their customers good value for their money. They don't seem to care anymore.